Is Instagram actually working for my business? We’ve got our hands raised too! You’re not alone. The new algorithm makes it even more difficult to connect with your people and measure the success of your Instagram efforts. Even though it’s important to not get too caught up in the numbers, it is good to keep an eye on them so you know how your Instagram is growing. This brings us to our topic of Instagram engagement. You may have heard the word “engagement” tossed around, but what does it actually mean? One reason why it’s not usually explained is because Instagram engagement can take on multiple forms, and tactics on how to achieve it can change a lot. Wait, what? I know it sounds like b.s and is confusing, but stay with me. Engagement simply measures the level of action your followers take on a given platform. Since we are talking about Instagram, it refers to the amount of people who interact with your content. So you want as much of that as possible! Increasing your Instagram likes is one of the best ways to improve your engagement. This is because Instagram uses likes as its biggest indicator of content quality. While likes are a great way to assess the popularity of specific photos, it doesn’t tell you much about how your audience values your content or what they like (or dislike) about it. It’s nice to know that many people are double tapping our photos, but we need more substance to measure our overall engagement. Likes are just the first layer of Instagram engagement so let’s go into more quality measurements. Don’t you feel accomplished when someone takes the time to comment on your Instagram photo? I know I do! It’s a great way to assess just how engaged your audience is with your content. One great way to increase your comments is by commenting first on other people’s photos. The more they see your comments pop into their notifications feed, the more likely they will be to leave a comment on your own photos. It’s a great way to network and build community! You have to be willing to give before you can receive. This mentality can help you massively grow your audience, as explained in the book Jab, Jab, Jab, Right Hook. With so many ways to increase your comment interaction on Instagram, it’s your opportunity to get creativity and test new strategies! Measuring video views is as easy as it sounds since Instagram counts them for you automatically. Not only that but it also publicly shows your audience how many people have seen your video, so it’s even more important to increase your engagement. In addition, did you know that videos typically perform even better than photos do on Instagram? That may seem backwards, but there are stats to prove it. This is because Instagram prioritizes engaging videos within its feed. I know, I know. Videos take more effort and can be a pain to produce, but knowing they can make a huge impact on your engagement may sway you to prioritize videos in the new year. Now that you know videos are great for increasing engagement, you can start brainstorming how to take your photo content and turn it into an engaging video. Have you heard the phrase “slide into your DMs”? I’m chuckling right now just writing that, but it relates to the professional world too. If your audience writes you a private DM (which stands for direct message), it’s considered a reply. This is usually a lower priority since it doesn’t have an affect on how well you perform in the Instagram algorithm. The interaction is private so it doesn’t grow your audience. Does this mean that Instagram replies don’t matter? Nope! Replies can be a great measure of engagement for service providers who use personal replies to attract new clients or book ideal brides using Instagram. Replies are also a great fit for personal brands who want to create a more humanized connection with their audience. All this talk about algorithms brings us to the next step: increasing your Instagram engagement with specific tips and tricks that work. After building my Instagram following from 900 followers to 12k+ in less than a year (which I teach about in my InstaSuccess course), I’ve learned how to increase Instagram engagement over time without sacrificing algorithm benefits. 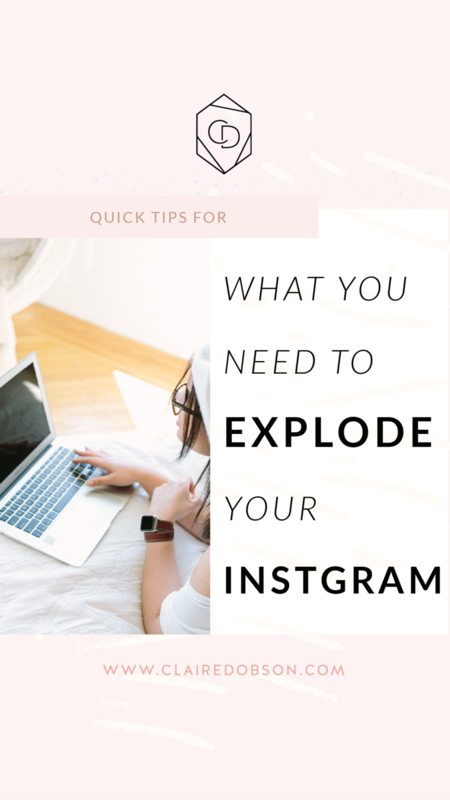 While most of my best, most exclusive Instagram engagement tips are within the course, I’ll give you a quick start guide so you can start taking small (but mighty) steps toward better engagement. You’ve probably heard that consistency is king when it comes to social media content, but did you know just how many benefits you gain with the algorithm in doing so? If you post on Instagram at least once a day and continue to increase your likes and comments, it tells the Instagram algorithm that you’re consistently producing high quality content. Instagram will then prioritize your content over Instagram users who use the platform sparingly. This is good news for those of us who put a lot of effort into the types of Instagram photos we capture. Before you start posting on Instagram, create a marketing plan for how you want use the platform. That way, you’ll be able to set and stick to a schedule that works for you, your audience, and the algorithm. You may be asking how to get more eyes on your content. Well, as you probably already know, it doesn’t happen magically. It also doesn’t happen overnight, but there are simple tricks you can implement to help you get started. One of the best ways to increase your Instagram engagement is by utilizing industry-specific hashtags with your Instagram photos. Hashtags give your photos the opportunity to be seen by bigger audiences. Unfortunately, you can't just copy the same hashtags over and over. You have to keep playing around with new ones so you get in front of new eyes. And all of your hashtags must be relevant to your field. You can start by searching on Instagram for a specific hashtag to see what comes up. Let’s take #weddingphotography for example. When you search for the hashtag, you’ll find over 11 million results. Wow! While you may think this hashtag is a no brainer, I would recommend using something more specific instead. The reason why is because your photo will get lost among a sea of competitors if you use a hashtag with this wide of reach. You may want to use #sfweddingphotography if you’re a wedding photographer in San Francisco, CA. This way, you only are connecting with brides in your local area and there are only 20,000+ photos in this feed as compared to millions in the other. No matter what industry you’re in, I recommend looking at how many likes the top photos have and see if you get anywhere close to that amount. If you do, then stick to those ones for now. You can also choose some that have more likes than your average post so you can grow into them. If you’re stumped on where to start, I have a freebie with 500+ Instagram hashtags to plug and play into your Instagram marketing strategy. Seriously! I call it my Hashtag Bible. I don’t post without it! Imagine Instagram is like an in-person networking event. You wouldn’t hear someone trying to start a conversation with you and ignore them, right? The same is true with social media. Increasing your comments on Instagram is great, but it’s even better when you use the comments as a way to build a relationship with the commenter. When your followers start to regularly connect with you, that’s a great sign that you’re doing something right! In other words, don’t leave them hanging. It’s best to take the time to reply back to your audience comments so you can start building your Instagram community. Then they don’t feel like they are talking to a wall. That’s no fun anyway. When you participate in conversations with your audience, it also helps you rank better in the Instagram algorithm because you’re using the platform organically. Just make sure you don’t use Instagram bots to write comments for you. It takes the personal touch out of your conversations. It’s your turn to measure (and increase) your Instagram engagement! I’m super curious to hear how your Instagram engagement increases when you implement these tips. Any additional questions? Join our Facebook group to post your question and share your successes!